Many flips and tumbling techniques found in gymnastics and acrobatics actually originate from classical Chinese dance. Classical Chinese dance has been around for 5,000 years, but only some 50 years ago was recently systemized. How is an art form thousands of years old still so amazing and fun to watch? Grace. Beauty. Energy. Thrilling leaps and spins. Classical Chinese dance has it all. Classical Chinese dance is extraordinarily diverse and boasts a wealth of techniques. It has been cultivated over millennia to become the comprehensive dance system we know today—one that is both elegant and exceptionally athletic. Performers of classical Chinese dance must connect every movement with their innermost feelings. With a steady gaze following an outstretched arm or the swift point of a finger, dancers can vividly convey emotions and breathe life into the historical figures they portray. Classical Chinese dance is a window into traditional Chinese values and aesthetics, and the perfect way to preserve precious traditions. That is why it’s the art at the heart of Shen Yun. Shen Yun’s story dances are like mini-dramas—a whole play compacted into 7 minutes! Shen Yun’s storytelling is all done through classical Chinese dance, which has a unique dance-acting element. By coordinating facial expressions with dance movements, dancers can portray any sort of character or personality. Which classic hero would you like to meet? A mischievous monkey who can fly? An imperial general forced to become an outlaw? Or a man who fights tigers with his bare hands, but only when drunk? Shen Yun’s story-based dances are drawn from China’s 5,000-year-old culture—a bottomless treasure trove filled with engaging adventures and mystical creatures with magical powers. Breathing life into these legends, Shen Yun highlights values that inspired the ancients for millennia, and that continue to resonate with all of us today. 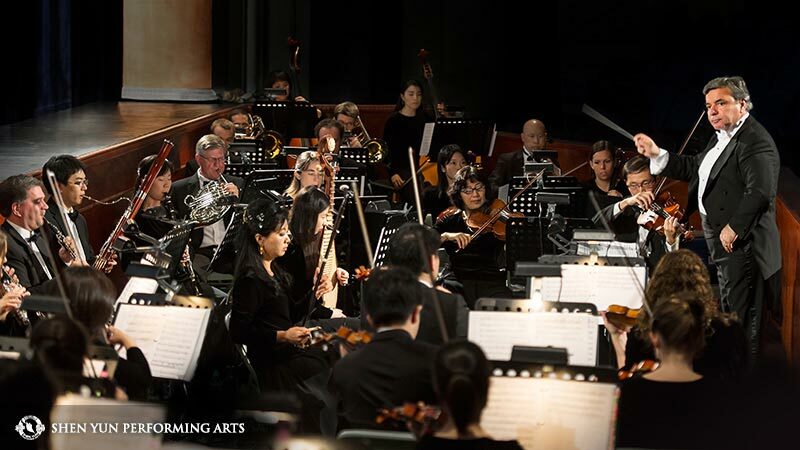 Every year, the Shen Yun Symphony Orchestra—with musicians drawn from Shen Yun’s five touring orchestras—performs classical Western pieces as well as Shen Yun originals at major concert halls around the world. How do you create the perfect harmony of East and West? Shen Yun has succeeded in doing what many have tried and failed at: seamlessly blending both Chinese and Western instruments in one orchestra. Where else can you hear traditional Chinese instruments—like the soulful erhu and the delicate pipa—alongside violins, trumpets, and clarinets? Shen Yun takes musical storytelling to a whole new level by combining the exquisite beauty of Chinese melodies with the grandeur of the Western orchestra. It’s a sound like no other. Discover for yourself why Shen Yun’s orchestra—which accompanies every performance, live—is garnering praise from leading musicians around the world. Every performance is heightened by moving selections from the company’s classical singers—vocalists who have undergone exclusive training to master an ancient bel canto technique that was once lost. Each vocal piece is specially written for Shen Yun performances. With profound lyrics that probe the mysteries of life, these songs transcend the boundaries of race and culture, resounding with a message of hope and peace. Every year, Shen Yun produces around 400 handmade costumes—and that’s not including the sample outfits created prior to the final ensembles that you see onstage! From emperors dressed in dragon robes to celestial maidens with flowing sashes, Shen Yun’s costumes are truly a sight to behold. With hundreds of colorful, handmade garments spanning China’s regions, dynasties, and ethnicities, every costume is inspired by authentic couture. Be it cloud capes and battle armor or ornate headdresses and flower-pot shoes, Shen Yun’s costuming stays true to history while breathing new life into fashion’s past. Many leading fashion designers around the world now consider Shen Yun a must see. "I was very impressed with the clothing and costumes… I saw here the best example about how fabric, clothing, and sleeves can enhance the movement and tell the story." In just 10 years, Shen Yun has traveled to over 30 countries and given some 3,000 performances! A performance leaving millions in awe. In just a few short years Shen Yun has grown to become an international phenomenon. Only a decade after its inception, Shen Yun now has five dance companies and orchestras that simultaneously tour around the world, performing for royalty, entertainment celebrities, government leaders, and many other important figures in sold-out shows at the most prestigious of theaters. Now is your chance to be a part of it. Don’t miss this opportunity to see what the world is talking about! “Shen Yun is extraordinary—everyone should come see it." —Drew Carey, actor, comedian and host of Whose Line Is It Anyway?